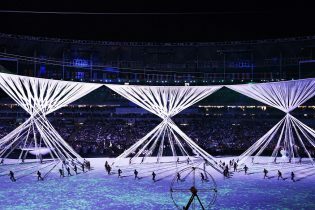 Stage One is delighted to have been commissioned to design, engineer and operate the scenery and performer flying system that took centre stage at the 2016 Olympic Games Opening Ceremony in Rio on Friday 05 August. Our crew installed a steel wire catenary above the stadium which enabled the aerial choreography of performers and scenery during the show. All of the hardware and software engineering for this aerial system has been designed, manufactured and installed by Stage One. 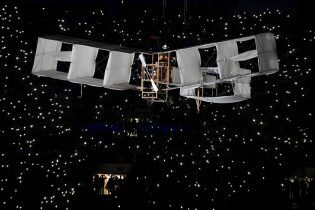 The system was used to raise the elastic curtain and to fly the 14-bis aircraft across the Maracana stadium. In the closing act the Olympic Cauldron was lifted into position next to the kinetic sculpture by our equipment and engineers. Stage One has provided engineering and automation to every Summer and Winter Games since Athens in 2004. Being asked to deliver elements for high profile ceremonies is something we have become used to. Each ceremony has its own character and challenges and this has been no different. We were delighted to have delivered a ‘clean’ show and crew look forward to our involvement in the Paralympic Opening Ceremony in September.